Although Argentina is mere, thousands of miles away from the recognised European "home" of Formula One Grand Prix circuit racing, it has organised qualifying rounds in the World Championship intermittently ever since 1953, although there was a gap of 12 years between Bruce McLaren's victory in a Cooper-Climax in 1960 and Jackie Stewart's win with a Tyrrell-Cosworth five years ago. Similarly it has a reputation for producing noteworthy drivers, particularly five times World Champion Juan-Manuel Fangio, twice British Grand Prix winner Froilan Gonzales and — more recently — current hero Carlos Reutemann who won several Grands Prix for Bernie Ecclestone's Brabham team and is now Lauda's team-mate in the Ferrari Formula One line-up. The Argentine Grand Prix has always taken place in the Autodromo Municipal de la Ciudad de Buenos Aires, but this spaciously laid out autodromo (built by President Peron in the late 1940s) has a great number of circuit combinations and it is only since 1974 that the 5.968-kilometre "Circuit number 15" has been used for the race. From 1953 to 1960 the 3.912-kilometre "Circuit number 2" was employed and in 1972 and 73 the 3.345-kilometre "Circuit number 9" was utilised for the Argentine Grand Prix. So you can see that a whole complex of tracks run in all directions round the "infield area", so much so that one feels a trifle inhibited even strolling across part of the complex that isn't in use just in case some "rabbit" has got confused and wandered up the wrong turning — and that has happened before now. Last year's Argentine Grand Prix never took place owing to a mixture of legal wrangling between the organisers and constructors, galloping inflation of the Argentine peso and the fact that President Isabel Peron's regime was crumbling precariously with the result that the military authorities did not want the added complication of a major sporting gathering as they were worried that some demented soul would start throwing bombs about the place. This year the last-mentioned aspect of the race hadn't changed even though the Automovil Club Argentina concluded the agreement with the Formula One Constructors for this year's race to take place. 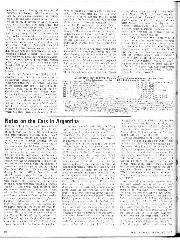 Throughout the winter there was plenty of protracted squabbling between the Constructors, the CSI and an organisation called "World Championship Racing" which was supposed to be representing the bargaining interests of several organisers including the Argentinians. 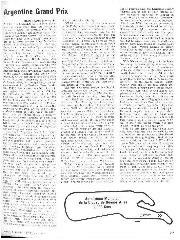 The details have been "hashed and dished" so frequently in so many places that we do not propose to go into them again except to observe that there was so much confusion that it was difficult to see who was doing what, and with which, and to so to speak. Fortunately somebody fired up some racing engines on the Thursday prior to the Argentine Grand Prix and when you've got two Ferrari flat-12s, two Alfa Romeo flat-12s, a Matra V12 and sixteen Cosworth V8s all screaming and burbling away it does tend to drown the bickering! Official practice for the race took place on the Friday and Saturday following Thursday's unofficial, untimed "warm-up” session. In terms of local popularity here was no doubt that Reutemann topped the polls but there were those who seemed to think that his installation in a Ferrari 312T2 would result in some magical transformation and he would completely dominate both practice and the race. Unfortunately things started badly for the Argentinian driver for he spun his new Ferrari 312T2/029 through several layers of catch fencing at the fast fourth gear "right/left" esses immediately following the pits during the untimed session on Thursday. The Ferrari only suffered minor bodywork damage and was repaired in time for the serious business on Friday, but it quickly became obvious that either Ferrari had gone backwards or simply become rather complacent over the winter and that their rivals had caught up with them. The very first timed session saw Patrick Depailler comfortably quickest in the aerodynamically revamped Tyrrell P34, the popular little Frenchman recording a best lap of 1 min. 49.63 sec. which was comfortably faster than the official lap record established two years ago: James Hunt (Hesketh 308) in 1 min. 50.91 sec. 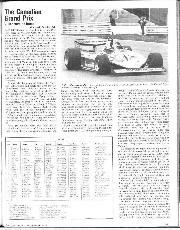 All the off-season testing seemed to be paying off for the Tyrrell team, but World Champion James Hunt was only 0.4 sec. behind him in his trusty six-speed McLaren M23 and the British driver put in a spurt during the second session to lap in 1 min. 48.68 sec., a time which stood as fastest for the remaining day and a half of practice and assured Hunt of pole position for the race. Both the works McLarens had been totally rebuilt for Hunt and his team-mate Jochen Mass, identical in specification to the last time they were used in October's Japanese Grand Prix. Spurred on by his team-mate, and maintaining the revitalised form he demonstrated in the last three races of 1976, Mass wasn't far behind the World Champion and finished Friday fourth fastest on 1 min. 49.731 sec. Whilst it was no surprise to see Depailler up with the McLarens, there was a surprise in store from Bernie Ecclestone's Brabham team who now have John Watson driving for them alongside Carlos Pace. Watson was thrown out of work when Roger Penske had a "tiff" with his banking sponsors and stalked out of Formula One, but Ecclestone quickly snapped him up and he fully justified his new employer's confidence by lapping in 1 min. 49.22 sec. on the first day. That meant he was third fastest overall and the Brabham-Alfa Romeo BT45 was running as smoothly and sweetly as could be hoped for all day. 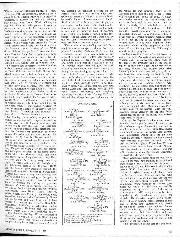 Watson was highly impressed with the engine's wide power band and low speed torque and as it was the first time he's driven it one must assume that the modifications to this flat-12 engine have made a worthwhile improvement. 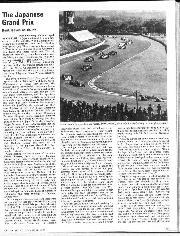 Even though the cockpit didn't quite fit him, Watson plugged on gamely throughout Saturday and, in only four laps of the final session, recorded a splendid 1 min. 49.6 sec. best to join Hunt's McLaren on the front row of the grid. With Watson setting the pace in the Brabham camp, Pace was getting more and more frustrated with a multitude of mechanical problems. Although the Brazilian managed fourth fastest time (1 min. 50.60 sec.) his BT45/5 promptly split a water hose which meant that he had to switch to the team spare (BT45/1) for the second session. Unfortunately Pace slid off the road during that second session, damaging the older car beyond immediate repair which obliged him to stop practising for the day. A fresh engine was installed on Friday night, but still the car had trouble with its cooling system and the final straw came when Pace rolled to a halt in BT45/5 on the first lap of Saturday's final hour-long session with the car boiling again. He strode angrily back to the pits where Ecclestone called Watson to hand over BT45/3 to his team-mate and in four lap Pace recorded his best time of 1 min 49.97 sec. in sheer bad temper which was good enough for sixth place on the grid! With all this going on Reutemann must have been wondering what on earth he left the Brabham team for because neither Ferrari was exactly shining brightly. Both drivers were complaining that their 312T2s didn't have sufficient traction and were consequently using so much rear wing angle that they were not particularly quick in a straight line. Lauda wrestled gamely with his car to such an extent that he half-spun on Friday (unusual for the calculating Austrian) but he could still only manage 1 min. 49.97 sec. on the first day, considerably quicker than Reutemann (1 min. 50.85 sec.). Lauda admitted that he was very confused and implied that there had been very little real development carried out on the cars while he was away during the winter having another corrective skin graft operation carried out on his face. Elsewhere along the pit front there were several other teams with varying problems. Ronnie Peterson's efforts with his Tyrrell P34 were hampered by the fact that he was suffering from a bad attack of influenza and his car sheared two front stub axles in quick succession which meant that he didn't get much opportunity to practice. His best turned out to be 1 min. 52.25sec. by the end of the first day which he subsequently improved to 1 min. 51.34 sec. on the second day although he was never happy with his car's handling. In the Lotus camp there was a multitude of problems with Nilsson's car consuming an engine during untimed testing and Andretti's beset with misfiring throughout Friday's two sessions. Right at the end of the second session the rugged American driver got everything straight and working, reeling off a confident 1 min. 50.13 sec. lap to take sixth position in the practice lists for that day. 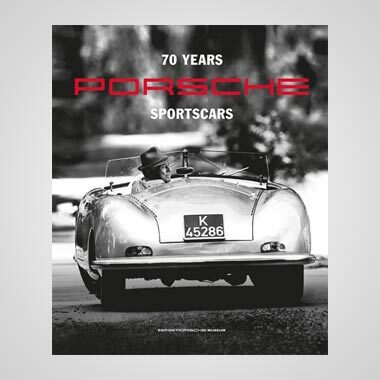 But no sooner had he crossed the timing line than a sudden explosion tore the front of his new Lotus to shreds as the steel fire extinguisher bottle mounted just behind the car's oil cooler disintegrated like a hand grenade. Hot oil spurted all over Andretti's helmet (and into his face when he lifted the vizor) as he fumbled down through the gears to stop the car, the clutch and brake pedals falling limply about in the footwell as their fluid cylinders had been ripped out by the blast. The American successfully brought the car to a standstill but the whole front bulkhead had been destroyed and closer examination revealed that the monocoque would have to return to England to be rebuilt. Accordingly Andretti took over Nilsson's car for Saturday's two sessions, but failed to equal his Friday best, while the Swede resigned himself to the role of spectator. Lauda put in a supreme effort in Saturday's final session to lift himself up onto the second row of the grid with a best of 1 min. 49.73 sec. but Reutemann continued to be inhibited by his Ferrari's difficult handling and could only record 1 min. 50.02 sec, which meant that he started from seventh place on the grid, proving that Ferraris don't provide instant miracles. There must have been a touch of irony in this whole situation for Brabham boss Bernie Ecclestone because the Argentinian had left his team because he had been disappointed with the Alfa-engined BT45's performance and now he was behind both of them on the grid. So often in racing it pays to stick with one project because it may eventually pay off whereas changing ships in mid-stream seldom reaps any dividends. In the Shadow team Tom Pryce worked steadily and unspectacularly with the sole DN5, hanging onto the bunch just behind the leaders with a best of 1 min. 50.65 sec. while the second of Don Nichols' cars was entrusted to the young Italian Renzo Zorzi as the result of a sponsorship arrangement with wealthy Italian Franco Ambrosio. Zorzi drove Pryce's old Shadow DN5/5B in the first three timed sessions but everything went wrong with it and he turned to the former Jarier DN5/4B for the final session in which he recorded his best time of 1 min. 54.19 sec., well off the pace. Other new faces in new places included Clay Regazzoni, the moustachioed Swiss seemingly enjoying his first helping of Cosworth DFV power in the apparently incongruous, down-to-earth surroundings of Morris Nunn's Team Ensign. Nunn is an uncomplicated and straightforward individual who goes racing because he loves it – not for money or any of the attendant "razzmatazz" – and one sensed that Regazzoni's hard driving style was just what Nunn wanted in his team. Despite changing rear suspensions a couple of times Regazzoni wound up recording a best of 1 min. 50.97sec. 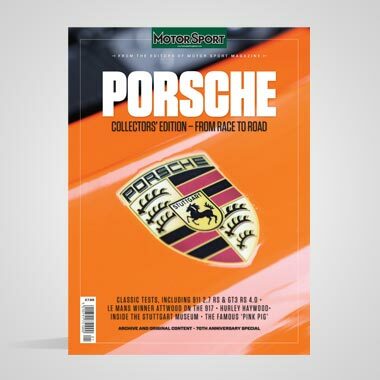 which put him fractionally behind Walter Wolf's new challenger driven by Jody Scheckter. The South African driver had plenty of problems during practice with the new Wolf which demonstrated a reluctance to pick up its fuel on right-hand corners, resulting in an intermittent misfire at high revs. The engine was changed on Friday night but the Wolf still declined to rev much over 10,000 r.p.m. on Saturday but Scheckter nevertheless recorded a 1 min. 50.76 sec. best which placed him ahead of Regazzoni on the grid. 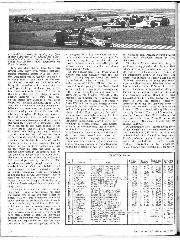 Hoping for an upsurge in his team's fortunes after recruiting Vittorio Brambilla to drive his number one TS19, John Surtees was very impressed with the Italian's "press-on" approach to racing but handling problems meant that Brambilla failed to improve on 1 min. 51.03 sec., fractionally quicker than the tardy Peterson. The second Surtees entry was for Austrian Hans Binder who set his best time in the spare TS19/01 during the second session after engine trouble with his allotted TS19/02. Disappointingly slow, Jacques Laffite missed out virtually all Saturday's practice when the Ligier-Matra JS7 began to blow out ominous clouds of smoke and the disappointed French mechanics pushed it back to its garage in the paddock for an engine change. Sticking patriotically to the Copersucar-financed family team operated by elder brother Wilson, Emerson FittipaIdi lapped in 1 min. 51.53 sec. with the extensively revised FD4/3 machine despite being troubled with electrical problems, a gearbox oil leak and sticking rear brakes. The former World Champion felt that there was still plenty of work to do on the car yet while his team-mate Ingo Hoffman was simply glad to be there for his second crack at Formula One although he looked a trifle lost in the maelstrom of Grand Prix practice. 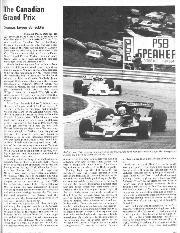 Finally, there were the works March 761Bs which were driven by "sponsored" drivers Alex Ribeiro and South African Ian Scheckter, elder brother of the Wolf driver. Ribeiro has graduated from the Formula Two world and had a preliminary taste of Cosworth power when he drove the ex-Guy Edwards Hesketh 308 in last year's United States Grand Prix at Watkins Glen. Ian Scheckter has experience of Formula One in South Africa and drove a couple of races for Frank Williams back in 1975. But neither March newcomer looked at home with his lot at Buenos Aires, inexperience on the circuit and an expensive penchant for bouncing their DFV's off the rev-limiter contributing to their lowly grid positions. One entry that failed to materialise was the BRM P207 which had been entered for Larry Perkins to drive and indeed Perkins was in Buenos Aires waiting for his car's arrival. Unfortunately when the BRM arrived at Gatwick to be loaded into its waiting Boeing 707 it was found that the crate into which it was packed wouldn't fit into the aircraft's cargo hold; despite the fact that British Caledonian had supplied the dimensions to Bourne beforehand! On Sunday the scorching Argentine heat seemed even greater with temperatures soaring to well over the 110 degrees, so it was easy to understand why the race was scheduled to start at four o'clock in the afternoon (before the Constructors intervened to change things, the ACA had planned the start for half-past five!). Led by Watson and Hunt the 20-car grid cruised steadily round their parade lap, returned to halt briefly on the grid before being signalled off by the legendary Fangio, 20 years after the old master had triumphed in front of his home crowd at the wheel of a Maserati 250F. The whole grid moved forward together but it was Watson who made the best getaway once they began to string out along the straight and the Ulsterman slipped his Brabham BT45 into the lead as they streamed through the first fourth-gear kink. Further back Depailler's Tyrrell had made a very slow getaway and Laffite found himself taking to the grass in order to avoid a couple of cars in front of him, the French car picking up generous amounts of debris in its radiator ducting. At the end of the first lap the order was Watson comfortably from Hunt, Lauda, Andretti, Mass, Reutemann, Pryce, J. Scheckter, Pace, Depailler, Peterson (who inadvertently flicked off his ignition and went down the pit lane before he realised his error! ), Brambilla, Regazzoni, Fittipaldi, I. Scheckter, Binder, Zorzi, Hoffman and the Ligier-Matra which was already misfiring badly. For the first few laps Watson maintained his lead at about 2.5 sec. with Hunt playing a waiting game and sitting comfortably a couple of lengths in front of Lauda. Andretti was keeping up constant pressure on the Ferrari while Pace was driving with great spirit and determination in the second Brabham-Alfa Romeo. Almost unnoticed Zorzi's Shadow retired with a mixture of gearbox and engine trouble while Laffite finally called into the pits for the first time on lap eight to sort out an annoying bout of sparking plug trouble. He briefly returned to the race before stopping again two laps later and by the time Laffite resumed racing for the second time the French car was a solid last. Watson was already feeling hot and flustered because no cockpit ventilation had been provided in either Brabham BT45 and the Ulsterman wasn't very comfortable in his make-shift seat which hadn't been specially tailored for him. He began to slow a fraction and Hunt sliced past into the lead on lap 11, moving away from his pursuers with disarming confidence and never looking as though he was having to try very hard. 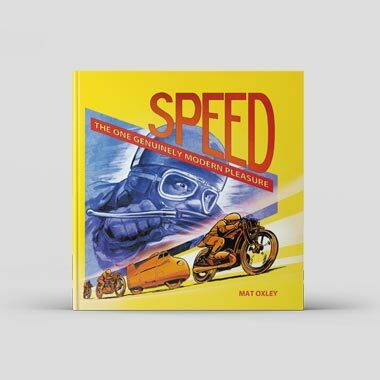 He later admitted that he was amazed at the speed with which he pulled away from the rest of the field, frankly feeling that he had plenty in hand. Andretti moved in to challenge Watson while Lauda dropped away first behind Mass and then behind Pace, his Ferrari's engine spluttering and coughing, obviously very sick indeed. On lap 20 Lauda decided that things had got bad enough for the whole car was vibrating badly so the Austrian pulled into the pits to see if there was anything that could be done. A quick examination revealed the fuel metering unit to be at fault and, as no repair could be effected quickly, Lauda climbed out of the car and retired. Further back down the field both the Tyrrell six-wheelers were having an absolutely diabolical time, Peterson calling it a day with his erratic-handling machine after a wild spin on one of the circuit's fastest corners after 28 laps while Depailler didn't last much longer, finally stopping after spinning off and finding that his P34's engine would not fire up again. As Hunt continued to pull away from the rest of the field Andretti slowly closed in on Watson until the Lotus was sitting right on the tail of the Brabham and at the end of lap 18 as they braked for the hairpin before the pits, Watson just slipped past Alex Ribeiro's March which was being lapped, but the Brazilian immediately cut back into line as the Brabham went past, running his car's right rear wheel over the left front spoiler on the Lotus nose section. Andretti was absolutely furious about this, but there was nothing he could do because the bent spoiler affected the car's stability on fast corners and he was forced to slacken his pace slightly. As a result Andretti soon began to fall back and was quickly passed by Mass and then Pace although he quickly made up one of these places on lap 29 when Mass spun his overheating M23 at the hairpin. With the temperature gauge virtually off the dial Mass abandoned his car on the infield and walked sadly back to the pits. 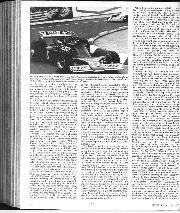 On lap 24 Pryce's Shadow came slowly into the pits its gearbox stuck in neutral, so his mechanics began dismantling the unit in an effort to find the trouble, while Reutemann spun his Ferrari on the infield loop section and immediately swung into the pit lane where his mechanics changed a badly blistered front tyre and despatched him back into the fray in eleventh place. Pryce lost 17 laps having a fresh selector fitted, but the Welshman re-entered the race nevertheless and was still circulating when the winner eventually received the chequered flag. Mass' retirement meant that the two Brabham BT45s were now running in second and third places because Andretti had dropped to fourth ahead of Jody Scheckter in the steadily driven Wolf. But there didn't seem any chance of anybody doing much about Hunt, the McLaren driver heading into his 32nd lap looking as confident as ever. At the end of the long start/finish straight the World Champion swung through the fourth gear Esses but while his McLaren successfully negotiated the right-hand part of the corner it unexpectedly slid straight on rather than negotiating the left-hand exit onto the straight. Hunt's M23 mowed down several layers of catch fencing before coming to rest and its driver leapt hurriedly out, unable to explain the cause of the incident. Subsequent examination of the rear suspension revealed that a bolt had broken and permitted the right rear suspension to collapse, throwing the McLaren out of control and sending it off the circuit. This unexpected drama left the two Brabham-Alfa Romeos leading the race in 1-2 formation, a satisfying sight for any racing team but particularly gratifying for Ecclestone's lads who have worked so hard in the face of so much adverse criticism to make these flat-12-cylinder cars competitive. But it was at this point that the realisation dawned that Scheckter and the new Wolf were in with a very strong chance. Up to now their progress had been steady and consistent but as the pit boards revealed Scheckter to be closing on the cars in front of him, so Scheckter drove harder. Although Pace grabbed the lead on lap 35 it was because Watson was slowing, his car handling strangely and the gears becoming difficult to select. 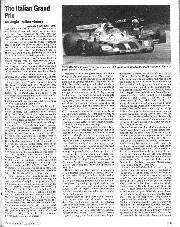 Three laps later Scheckter moved past Andretti and soon afterwards inherited second place when Watson pulled to a halt on lap 42 with the gearbox literally failing off the back of the Alfa Romeo engine after the securing bolts had broken. At the rate Scheckter was closing on the obviously ailing Pace it was clearly just a mathematical equation as to when the new Wolf would take the lead. Utterly exhausted in the searing heat and feeling sick in the stomach, Pace was no match for the now hard-driving Scheckter and Walter Wolf's blue and gold machine rushed past the Brazilian with only six laps of the race left. At that point Pace slowed alarmingly and dropped over 40 secs. on the winning Wolf between laps 48 and 53, just hanging on long enough to scrape home ahead of Reutemann's Ferrari which was being cheered to the echo of thousands of delighted Argentinians. Reutemann really drove well after his pit stop even though it must be admitted that his climb back from 13th place was aided by a number of retirements and that, on past form at least, a healthy Ferrari should be more than a match for the Fittipaldi car even if E. F. is driving it. But that was all lost on the crowd as Reutemann sped past the yellow Brazilian car with two laps to go and almost added another Brazilian to his bag by closing dramatically on Pace during that frantic final lap. Behind Fittipaidi in fifth place came Mario Andretti although his Lotus chewed up a rear wheel bearing and he was stationary at the hairpin before the pits with only 51 laps completed when Scheckter took the chequered flag. Regazzoni finished sixth, taking it easy over the last few laps after a pit stop to examine a badly worn rear wheel bearing which was allowing one of the rear wheels to flap about rather alarmingly while Brambilla's Surtees TS19, which had been stuttering round with fuel-feed trouble, moved slowly across the line to complete 48 laps after waiting just before the flag for the winner to arrive. Neither of the unimpressive Marches finished. Ribeiro stopping with a broken gear lever and Ian Scheckter retiring when a battery lead broke off. For Jody Scheckter and Walter Wolf it was a joyous, albeit rather lucky, first-time victory. Their main asset had proved to be consistency and stamina in the stifling hot conditions under which the Argentine Grand Prix was run, but they are very conscious that "one swallow doesn't make a summer" and they have plenty of development work still to do. Nevertheless, it was an encouraging start to the year; many teams currently in Formula One have been racing for several years and still haven't even scored a "lucky" Grand Prix victory!—A.H.